Should I start a GoFundMe? Reader Amy called my attention to this awesome product from The Ozark Source. Somehow I can’t justify spending the dosh on it, but oy, is it awesome! This is too menial a task to call the duck “James,” but “Billzebub” fits it nicely. This entry was written by whyevolutionistrue and posted on October 13, 2018 at 2:30 pm and filed under capitalism. Bookmark the permalink. Follow any comments here with the RSS feed for this post. Both comments and trackbacks are currently closed. Is this to be set up at the pond? It sure beats Toilet Duck. 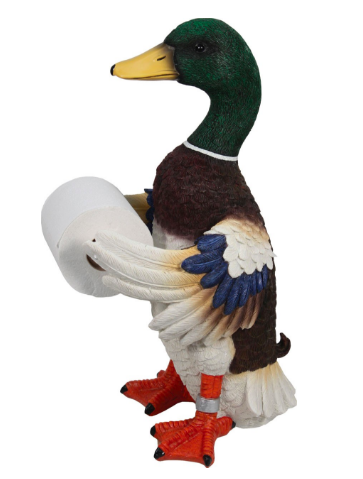 It’s very appropriate – a Toilet Duck that gives you the sheets. Why not a GoFundMe for moving that (actual) duck out of his puddle and into the ‘mainland’ of New Zealand, or elsewhere? I think there would be less trouble finding a few other ducks to join him. In that tiny shrinking puddle as the dry season approaches? The first think I noticed about the duck is that he’s banded. Is this so that researchers can track his migratory route to my bathroom? I find that a bit scary. Is that what one uses to wipe one’s quack? Seems like the thing you find advertised in the mags in the pouch on the back of Airline seats . This picture is making me frown. Wonder if Stephen Barnard would paint his toenails red? When homeboy wears THESE, well, it’s quiet for him. . Very good! LOL. I think the idiom is “homeboy” ~ isn’t it? Or was that last week? Yeah, it’s “Homeboy”. I made a typo. Thanks for the laugh this morning Jerry. I really did lol at your homeboy comment. And I have to agree: if homeboy was wearing those, it would be quiet for a while! Too expensive—are you serious? Given your passion for ducks, Jerry, if you scale this purchase in terms of cost per duck post you have every posted, it is about a penny per post. A bargain if I have ever seen one. If it were me, this would be in my bathroom faster than you can say “ducks rock”. Do it for the ducks. You know you want it. Why resist? If you put it out by the duck pond to gauge the ducks’ reactions, you could count it as a research expense! The person who designed that duck has no appreciation for a real mallard’s speculum. Jerry would not be happy with this travesty. Indeed; if that’s a speculum, it’s in the wrong goddam place! At least they got the curly tail feathers right! Is that roll Under or Over? You beat Diana to it! I was gonna say: Duck sez “Over”. Diana won’t like that. There is also a mallard wine bottle holder, if you are interested. I own one (a gag gift from my father) but it’s function does not meet its form, or perhaps it holds a bottle of wine about as well as a real duck could. Also a corkscrew. This is not a bad approximation to the shape and proportion to a mallard’s genitalia. You need to patent that idea now! A sure sales hit. Honestly, and my apologies for being the party pooper, but I think it is not really in good taste. But then, “de gustibus non disputandum esset”. And I’m guilty too: I once had a shark jaw toilet seat. I have to get one of these. As an Oregon Duck fan, it will make the perfect gift to send to my obnoxious Washington Husky acquaintance. Looks like that price is actually a steal, when you look it up on Google shopping it goes for closer to $100 in a lot of places! So did you end up getting it? If you don’t have it by Christmas post again and I’ll take up a holiday gift collection among my bird-loving friends and send it off to the U of Chicago – don’t want to double gift if you already got it though!